It’s summer time and that means more more more comics. I’ll have comics spewing out of my brain as well as many other places! 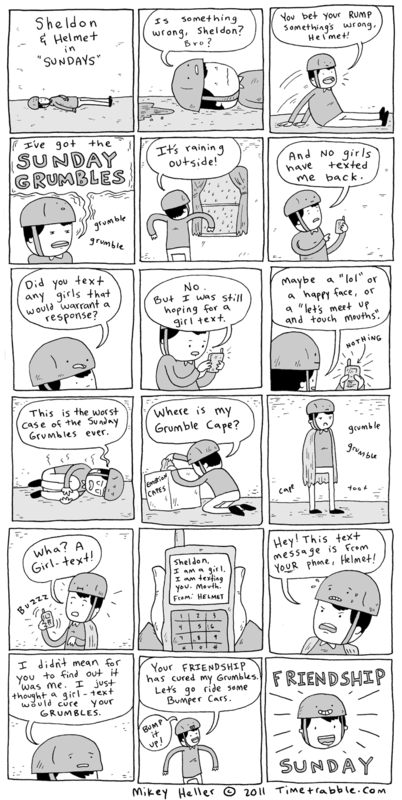 This comic in particular will featured in an amazing zine edited by Yasmine Tashk! Also I’m bringing back FIVE DOLLAR DEATH COMICS! Oh hey, who wants to ask me questions? I made one of them formsprangs. ASK QUESTIONS. Oh my god I love this comic. Yay, a new Time Trabble. Love the Sheldon and Helmet series, cheers! Well, they’re all pretty awesome, but this one is ESPECIALLY awesome. This comic is incredible! Absolute joy! Ha definitely my fave so far, so good! I love Sheldon and Helmet. You are an awesome dude, Mikey. I don’t get “it’s raining outside”. Why is that a problem for adults, but fun for kids? Have we forgot how fun it is to run around in the rain and get all soggy? And comming inside again, dry up and have hot chocolate? I can’t explain how awesome this is. Every panel. Every damn panel.